Consider the following: You are stretched out in a chair at The Sugar House Dentist in Salt Lake City. A dental assistant clips a paper bib around your neck. Someone clicks on a bright overhead light and you see latex-gloved hands moving toward your open mouth. You close your eyes. Does your heart start to pound? Are your palms sweaty? If so, you may be a good candidate for sedation dentistry. Sedation dentistry uses medication to help patients with dental anxiety get through their appointment. Too many people with this type of anxiety skip the dentist altogether. That’s a no-win situation, because it puts their dental health at risk. The Sugar House Dentist provides two types of sedation dentistry to those patients who need it: nitrous oxide, and oral conscious sedation. Nitrous oxide, also known as laughing gas, is a safe and effective way to relax in the dentist’s chair. You breathe in the nitrous through a mask, and within a minute or two are feeling light-headed. You may not laugh, but you’ll be very relaxed. Nitrous oxide wears off quickly when the procedure is finished. Oral conscious sedation is a moderate sedation level. You take a sedative before the procedure. When it takes effect, you won’t sleep, but you may slur your words. Most patients don’t remember much of the procedure afterward. You need someone to drive you home. Don’t let fear prevent you from getting the dental treatment you need. 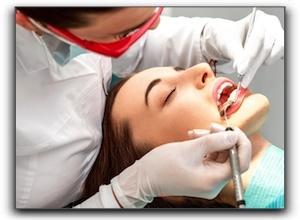 Call The Sugar House Dentist in Salt Lake City to find out about sedation dentistry. We provide family and cosmetic dentistry, and are a mercury-free practice. Stomatitis in Salt Lake City: Small Annoyance Or Serious Problem?